For many travelers, an airplane trip is a time to check out. It’s an opportunity to decompress and relax, maybe to watch a silly movie or do a crossword puzzle or take a nap. But if you’re a frequent traveler, air travel starts to represent a significant portion of your time. 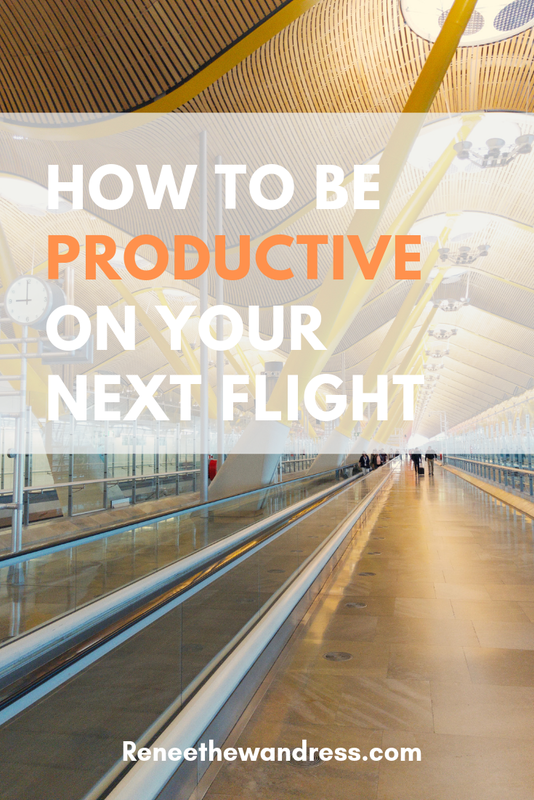 You start eyeing that time in your schedule and wondering if there is a way you can be more productive on your next flight, rather than dozing off before the flight attendant even brings you your second glass of wine. Working on the plane is a challenge. It’s difficult to focus when you’re in a cramped and less-than-ideal space, staring at your laptop screen in the dark while everyone around you is completely relaxed and just enjoying the ride. But think about it this way: if you manage to work on your flight, you’ll have to work less when you get to your destination. You can use the flight hours for productivity, rather than being obliged to do nothing on a long plane ride. I don’t know about you, but I don’t have that much spare time lying around. So if I can take advantage of an extra few hours to work, so that I can fit more fun into my schedule later, I’ll jump on it. As soon I arrive at an airport, I always check Sleeping in Airports to find the best place to set up shop. Sleeping in Airports is a review site for airports, and it is a great free tool to get familiar with. Here’s how it works: travelers post detailed reviews that give you the lowdown on the airport, such as where there’s food, what the wifi is like, where there are tables or other comfortable sitting arrangements, where the electrical outlets are and, as the name suggests, the best places to sleep overnight within the airport. I use this site to save myself time scouting out the best place to sit where there’s comfortable seating and electrical outlets. I read the airport overview and other people’s reviews, then go right to the best spot mentioned and get to work. And of course, if you use the site, don’t forget to leave your own reviews to make this little digital nomad community more informative and useful for everyone! Consider packing your own food, both for the airport and the airplane. You never know what food will be available at your terminal or what will be served on your flight. If you’re trying to use this time for productivity, you don’t want to be wandering through the airport looking for food or getting distracted on the plane because you’re so hungry and the food cart is still at row 3, while you’re back in row 27 wishing you hadn’t passed on the free peanuts. Many people don’t realize they can bring their own food on the plane. Yeah, TSA has limitations on certain things, like soups, yogurts, and anything else not solid. But if you bring things like sandwiches, fruit or vegetable slices, candy, etc you should be completely fine! And you will save a ton of money and time. Another nuisance, both on the plane and in the airport, is the garden variety of noises you will hear in the background. Announcements, sounds of planes, other people’s conversations, babies crying, you name it-- it can all be really annoying when you’re trying to work. Music is a great solution! You’ve just got to have a way to listen to your own tunes without WiFi. Most music subscription plans like Spotify Premium, Google Play Music, and Soundcloud Go take care of this for you. If you’re not into subscription plans, a good old fashioned iTunes playlist will do the trick. Just get your music offline, so that you can keep it pumping during the whole flight. In my experience, you can’t rely on the quality of the wifi on planes, and even if your flight says it has electrical outlets, you just never know. I’ve been stranded with a dead laptop on a long flight to China that supposedly had electrical outlets AND wifi, and neither the wifi nor the outlets actually worked. Ha. Anyhow, the best thing to do is save all of your work for offline viewing. Use Google docs; it’s really easy to save your work for offline viewing and editing, and have your changes sync to the document the next time you have wifi. And get a power bank . Power banks let you charge your devices without plugging them into a wall outlet. If you bring it with you on your flight, you get an extra charge for each of your devices so that you can use them twice as long. Good, noise-cancelling headphones have been a life saver for travel productivity, both while traveling and while working from coffee shops and hotels. I’m a person who finds it so distracting to hear noises outside of my headphones; I feel compelled to look up and investigate every. Single. Time. That’s why I HAVE to use headphones with good sound quality that help me stay immersed in my work, even when there’s a lot going on around me. It’s worth it to invest in good headphones that fully blank out the noise around you. Cheap $10 headphones have their place. I mean, they’re great for taking to the beach because you don’t have to worry about them getting broken. But if you’re trying to work in an airport, or a coffee shop for that matter, that’s a different story. If you can still hear everything that’s going on around you, that’s just going to cost you in productivity instead of money. Even if you were happily working away in the airport after clearing security, there’s still that transition time when you have to board the plane and stow your laptop for take off. It’s easy to lose focus during this waiting period when you’re not able to access your laptop. But you don’t want to do that, you’ve got to keep your eyes on the prize! Try to stay productive. You could take this time to outline your productivity goals for the flight. You can also try to work on your phone during this time. For instance, as a freelance writer, I might download an assignment to my phone so that I can edit and review it during boarding and takeoff. I don’t know about you, but cramped spaces are a productivity killer for me. If you’re going on a long flight, it may be worth it to splurge for the extra leg room upgrade. That way, you won’t have another passenger leaning their seat back in your face and making it impossible for you to stay productive. Breaks are natural, especially for a long flight, but how do you keep a short break from wrecking your productivity? I find that setting goals for what I need to accomplish by the end of the flight helps me stay accountable. Chunking tasks into batches (and then taking quick breaks in between) also helps. So, accomplish goal set #1, take a timed nap or watch a TV show, then go back and accomplish goal set #2, take a break and do some reading or eat a snack, accomplish goal set # 3, and so on. Have you tried the Pomodoro method? It’s where you work on a task for 25 minutes and then take a short, 5-minute break. This could be something to implement on your long flights! Let me know if any of these tips work for you on your next flight, or if you’ve tried something else that works! I’m always looking for more ways to supercharge my airplane productivity. I’m all about maximizing the use of my time, so working during flights is a no-brainer for me. But it’s still challenging! I hope some of these recommendations are helpful for you to get in the work zone while flying.